The research report presents a detailed study of the global fluoroscopy and mobile C-arms market that includes quantitative as well as qualitative assessment of the market. The report is titled “Fluoroscopy and Mobile C-arms Market - Global Industry Analysis, Size, Share, Growth, Trends and Forecast, 2013 - 2019” and is available for sale on the company website. A recent market study published by Transparency Market Research (TMR), offers a comprehensive analysis of the global fluoroscopy and mobile C-arms market, underlining the current situation of the industry and how it is going to impact the future of the fluoroscopy and mobile C-arms market, worldwide. The global fluoroscopy and mobile C-arms market had reached a value of US$1.69 billion in 2012 and is estimated to be worth US$2.08 billion in 2019, expanding at 3% CAGR from 2013 to 2019. The market for fluoroscopy and mobile C-arms devices worldwide is evaluated on the basis of product type and region. Based on types, in 2012, fluoroscopy devices accounted for the largest share of the fluoroscopy and mobile C-arms devices industry in terms of revenue. 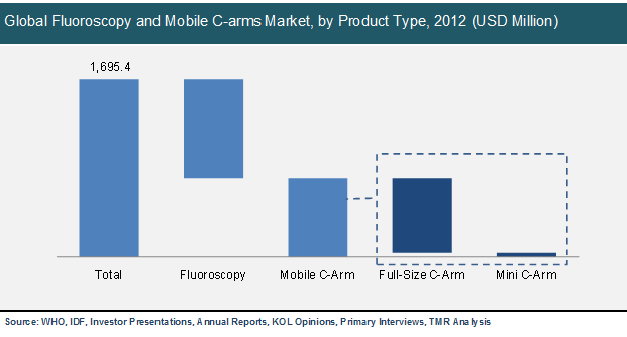 However, the mobile C-arms section is dominating the fluoroscopy and mobile C-arms market at present in terms of volume. Mobile C-arms are further classified into mini C-arms and full size C-arms. It is anticipated that the full size C-arms segment will develop at a faster pace in the global fluoroscopy and mobile C-arms industry during 2013 to 2019. The development in full size C-arms devices market is credited to technical advancements in the field and multiple applications. Regionally, North America led the global fluoroscopy and mobile C-arms market in 2012, both in terms of volume and value, due to the increasing awareness about medical imaging equipment, financial stability to purchase expensive devices, adoption of new and innovative products, and growing infrastructure investment to support medical and healthcare development. On the other hand, the fluoroscopy and mobile C-arms market in Asia Pacific is likely to develop at the highest compound annual growth rate in diagnosis and interventional radiology procedures.